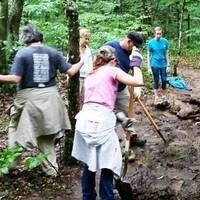 The Friends of Ridley Creek are out on the first Saturday each month, rain or shine, keeping the park's trails ship-shape. All are welcome! The Commitment: Assemble 9:00, work until no later than noon. Wear: Long pants, otherwise dress for the weather. Bring: Water, Work gloves if you have them, insect repellent with 20-30% DEET. Bring friends and family!